After the debut of the three all-new light-duty, trucks for the 2019 model year, the focus of the public is now switched toward the 2020 model year and the introduction of the redesigned heavy-duty models. Ram’s heavy-towing trucks are just a few months from the debut which should occur early next year and the prototypes are testing on the roads in multiple configurations and various trim versions. The current Ram HD arrived in 2010 with the radically new styling and multiple cab and powertrain options. The fifth-generation Ram HD follows the redesign of the brand’s fast-selling Ram 1500 and the more capable versions should borrow heavily from the smaller sibling. 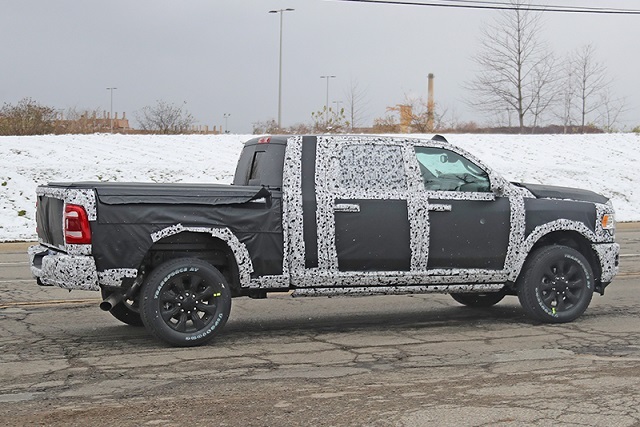 Among the spotted prototypes, the three-quarter-ton 2020 Ram 2500 was also in front of the camera and we can expect that the new-generation Ram HD will apply the similar design language and surely use the mixed-material strategy as the smaller workhorse. The interiors should also be very similar and loaded with the latest tech and safety equipment. The truck will also get more efficient powertrains but more precise details will appear after the debut. 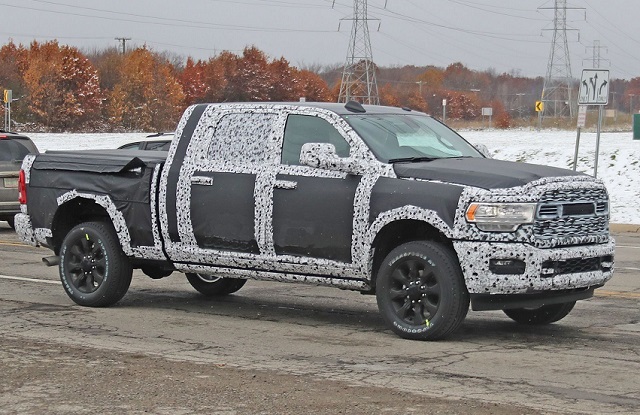 When we are speaking about the styling of the new 2020 Ram 2500, the multiple spy photos of different truck’s configuration prove that Ram won’t change the logic used for the all-new Ram 1500. Although, we can recognize similarities with the current generation version, the high dose of the similar styling cues we can recognize from the smaller Ram. The new Ram HD will get the similarly shaped grille and headlights, although we can spot some unique details on the lighting units. The design of the grille and headlights will also vary depending on trim version and like on the light-duty Ram, we haven’t spotted the cross-hair grille style on nighter prototype. However, the Power Wagon will also appear with the Rebel trim-like style. The HD will also copy the half-ton version in terms of the structural upgrades. The high-strength steel will play the role in the improved capability and more rigid chassis. The lightweight materials will, on the other hand, shed some weight from the body panels. When it comes to the interior design, Ram won’t also try reinventing the wheel. The spy photos of the cabin reveal the same dashboard layout and large center display in the middle as on the smaller Ram 1500. The newest UConnect infotainment system will appear with the different display sizes, with the base models starting with the 5-inch display and with the 8-inch or 12.0-inch upgrades on higher grades or optionally. Ram will also introduce new textures and fresh materials for the new generation version and provide multiple storage compartments inside the cabin. Like the smaller cousin, the workhorse could gain a more comfortable cabin thanks to the extended size. What will also be the step forward is the introduction of the active safety systems. The truck will gain systems such as the automatic emergency braking, surround-vison cameras, lane keep control, etc. 2020 Ram 2500: What could change in the engine department? What FCA has in mind with the engine options for the 2020 Ram 2500 is still unknown. Unofficial sources claim that similar engine lineup will appear with the new generation Ram HD. But there are also reports that a base 5.3-liter could be ditched from the equipment list for the new model year. On the other hand, the larger V8 gasoline and six-cylinder diesel seem like the sure bet for the return. In the current form and with the six-speed automatic gearbox, the 6.4-liter V-8 engine makes 410 hp and torque of 429 lb-ft. The new generation should, however, bring the improved efficiency measurements and performance. To that could also add the expected 8-speed automimic transmission. The proven 6.7-liter six-cylinder diesel will also reappear and with the improved design and the new transmission system should also bring better performance. The current version provides up to 800 lb-ft of torque and 370 hp in the Ram 2500 while boosts the torque up to 930 lb-ft in the one-ton Ram 3500. The big reveal of the redesigned 2020 Ram 2500 should be at the Detroit Auto Show, early next year. Then we will know all the details while the price of the model will appear later. The current version starts from mid-32,000 but more sophisticated design and equipment will surely lift the base price slightly upper.